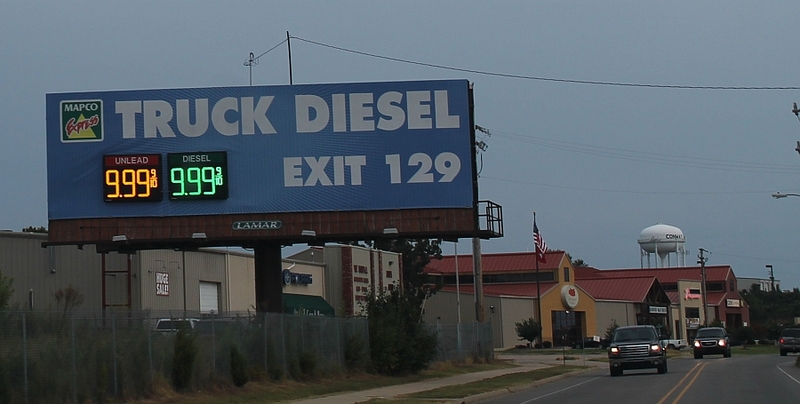 I saw this the other day while driving around central Arkansas. Fortunately it’s not true! But that’s the actual sign — no Photoshop or other editing. The gas station / truck stop has been completely demolished, to be rebuilt bigger and better. They tore it down the old-fashioned way rather than blowing it up. I can understand there being some logistical issues with exploding a gas station, but it would’ve been really awesome to see (albeit from a safe distance). Plus there’s another gas station across the street, so you’d get a bonus two-for-one explosion! There is also a nearby car lot, which would probably result in more explosions. And there’s a large billion-dollar company close also. 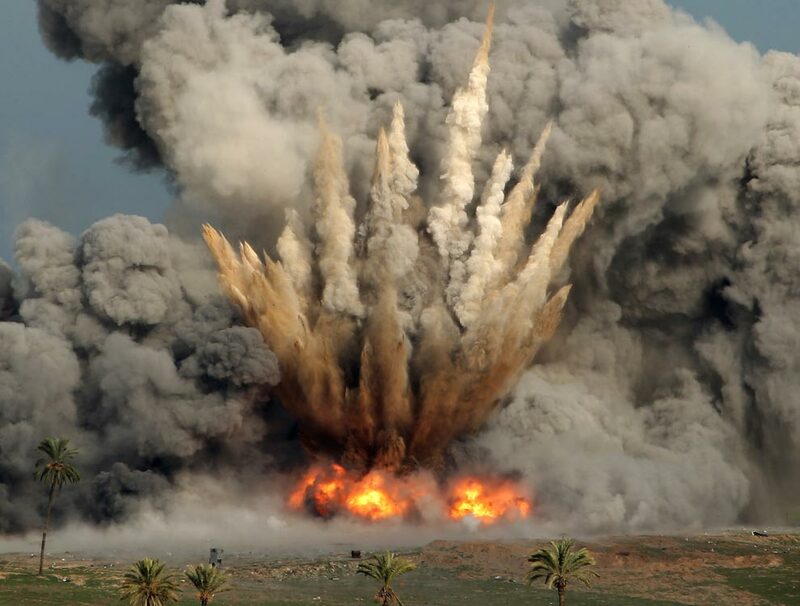 So the collateral damage would get expensive really quick, and thus this cannot happen. Last week the Buffet o’ Blog staff and a few friends met at Cheeburger Cheeburger in Little Rock, AR, to conquer their so-called burger challenge. Their “challenge” is called “Our Famous Pounder”, and it starts with 20 oz. of beef plus whatever toppings you want. It doesn’t sound too intimidating to me! If you eat it, they take your picture and put it on the wall with the other “Wall of Famers”. 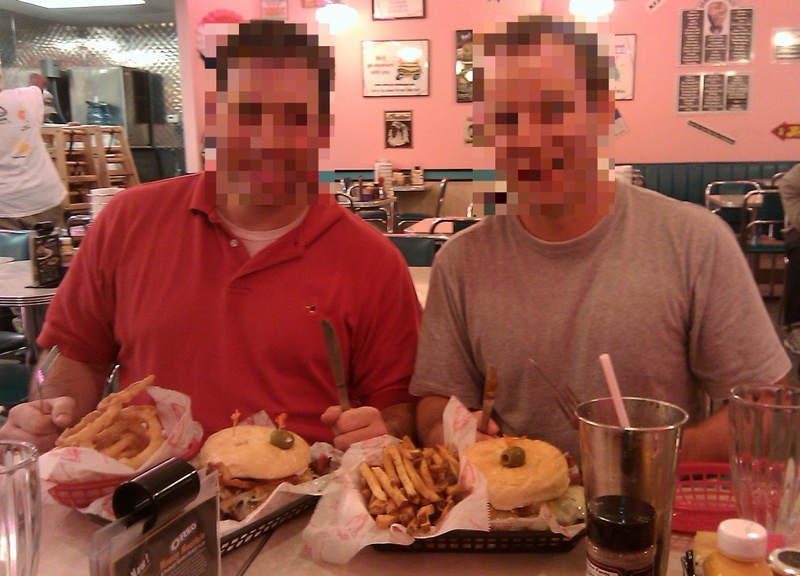 Two of the guys in our group attempted and both conquered the burger, plus some fries and/or onion rings, and a regular milkshake. While it’s an achievement worthy of recognition (hence the post), one of them requested his secret identity remain secret (probably so his wife wouldn’t know he ate the whole thing). Of course more pictures could’ve been taken, but I had food of my own to eat, so this is all you get. Besides, it’s not that much of a challenge. I’ve eaten meals larger than that before. The milkshakes were excellent! Mine was chocolate with brownie batter, peanut butter, and Oreos. They have a LOT of choices for milkshakes and malts — looks like around 70 options. Someone at the table suggested a huge conglomeration of toppings, but it got to the point where there wouldn’t have been room for ice cream. I suppose a line has to be drawn somewhere, unless they keep making the glass bigger as you add more toppings. All in all, it was a great time. It was a great choice for a guys’ night out. Highly recommended! 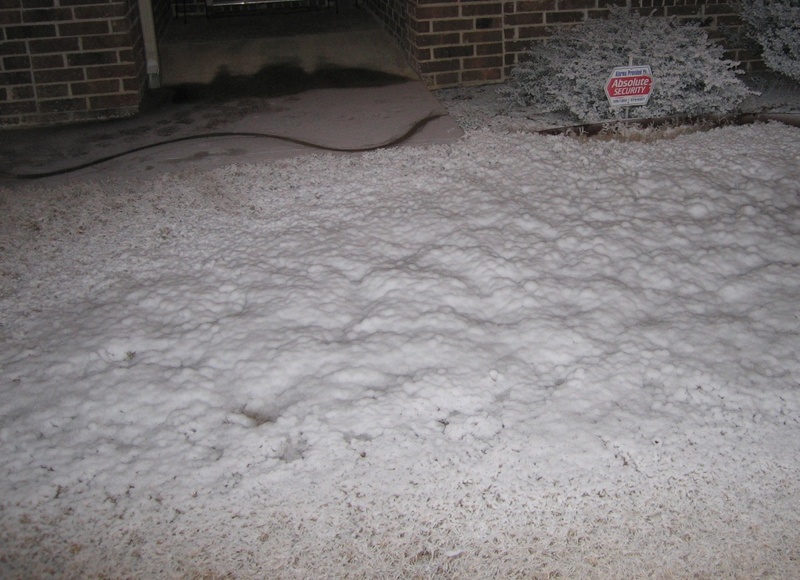 It’s great to live in the South… for numerous reasons, but on my mind now is how we don’t take snow for granted. A few days ago, we got about 5 inches of snow here in central Arkansas, and there are still things shut down. There’s a lack of equipment for clearing roads and bridges, and we often see some degree of ice with these winter storms that produce snow. The first night of the snow, I saw a local news program that was listing closings on the screen, and one said “City of Conway closed”. 🙂 I’m sure that was meant for the local government, but it was very accurate nonetheless. I didn’t get to build my (long dreamed of) ginormous snow castle nor Snowzilla, but hopefully there will be other opportunities. 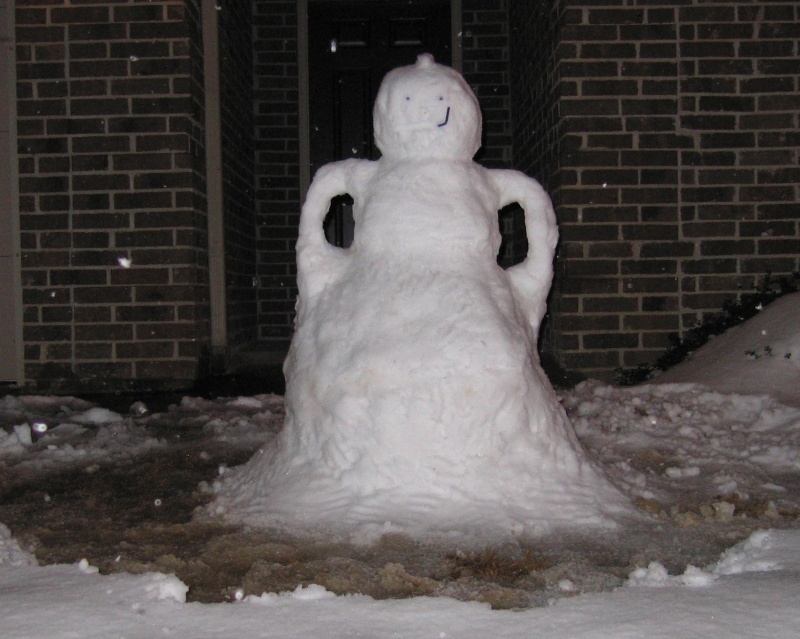 I did get to build a snowman, though, and he’s one tough snowdude. He has his arms bowed up at his side, ready to fight, and he has a mohawk. He could definitely beat up your snowman. 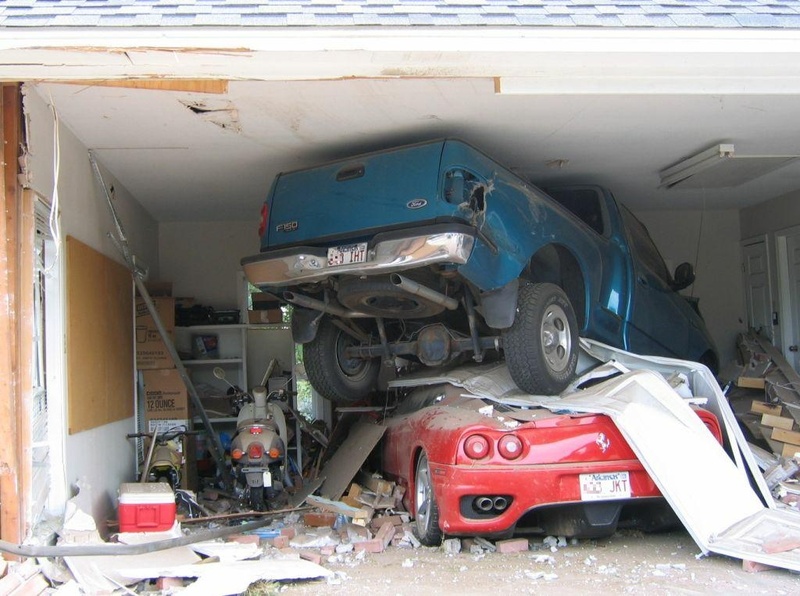 This week’s caption contest involves a photo of a horrendous car crash inside someone’s garage. And it happened here in Arkansas. (Before anyone asks, I don’t know these people personally. And I blurred part of the license plates to protect their identity.) I have no idea how this kind of accident happened, but that’s where we all come in. We get to write the caption / commentary / news release for this picture. You can write it from the point-of-view of anyone, such as the owners of this debacle (which could be a husband, wife, teenage children, or college roommates), the insurance agent, the neighbors, friends, yourself, etc. Just make it funny. Anyway, one of the TV news stations in Arkansas recently had a poll on what the state fish should be. So far the top vote-getter is the blue catfish. Also worthy of mention is crappie, bass, and trout. But receiving 25 percent of the vote was “fried fish”. I don’t know that “fried fish” should count as a state fish, because that’s very ambiguous, but then again, we are in the South, and deep-frying food is like a pastime to many people. Also, another reason why I can see a vote for that is because they taste great! 🙂 I realize you probably won’t find fried fish in fancy restaurants, nor would you find catfish, but it makes for some great eatin’! Add some fries and hushpuppies, along with lots of ketchup, and you have a feast! Last night I had the Buffet o’ Blog staff over to my house, and as always, it was a great time. Just the sheer amount of awesome in one place is enough to make some people jealous that they weren’t invited. But we did something that may cause additional feelings of jealousy: We made it snow. (Yeah, you read that right.) One of the guys built a snow making machine. The outside temperature was right at freezing when we started it, but it cooled down enough that we had some accumulation. I realize we have some readers in other locations, even as far north as Canada, so getting snow may seem ho-hum to you, but here in Arkansas, we haven’t got a real snowfall yet this year — just some ice and sleet. So this is a big deal. This is exclusive snow. And it’s homemade.